The RG6 coax cable is used for CATV-community antenna television and VCRs and CCTV-closed-circuit television. It uses F-plugs to connect on both ends. It features low-loss, double shielding which ensures less interference in your picture and sound. The CE TECH HDC1206NCU Surge Protector is ideal for home entertainment and Home Office protection with 4500 joules, 12 outlets, 2 USB (3.1-Amp shared) charging ports, RJ45 network protection and a 6 ft. cord. The surge protector provides protection for HDTVs, cable/satellite receivers, personal computers, cable modems, phones/fax/DSL, printers, stereos, and CD/DVD players. The HDC1206NCU features 12 outlets with 6 widely spaced outlets, MOV technology to guard the surge protector and connected electronics against line abnormalities and lightning surges, while EMI/RFI filters block unwanted line noise. The RG-6 Coaxial connectors provide protection for cable/satellite TV receivers and broadband modems. Data line protection is provided via RJ-45 ports for networking and telecommunication devices such as phones, faxes, modems, and DSL lines. The 6 ft. power cord includes a right angle plug with a 45 off-set for convenient installation in the tightest of environments. The CE TECH HDC706C Surge Protector is ideal for home entertainment and Home Office protection with 2100 joules, 7 outlets, Coax protection and a 6 ft. cord. The surge protector provides protection for HDTVs, cable/satellite receivers, personal computers, cable modems, phones/fax/DSL, printers, stereos, and CD/DVD players. The HDC706C features 7 outlets with 1 widely spaced outlet, MOV technology to guard the surge protector and connected electronics against line abnormalities and lightning surges, while EMI/RFI filters block unwanted line noise. The RG-6 Coaxial connectors provide protection for cable/satellite TV receivers and broadband modems. The 6 ft. power cord includes a right angle plug with a 45 off-set for convenient installation in the tightest of environments. The CE TECH HDC806CU Surge Protector is ideal for home entertainment and Home Office protection with 4200 joules, 8 outlets, 2 USB (3.1-Amp shared) charging ports and a 6 ft. cord. The surge protector provides protection for HDTVs, cable/satellite receivers, personal computers, cable modems, phones/fax/DSL, printers, stereos, and CD/DVD players. The HDC806CU features 8 outlets with 2 widely spaced outlets, MOV technology to guard the surge protector and connected electronics against line abnormalities and lightning surges, while EMI/RFI filters block unwanted line noise. The RG-6 Coaxial connectors provide protection for cable/satellite TV receivers and broadband modems. The 6 ft. power cord includes a right angle plug with a 45 off-set for convenient installation in the tightest of environments. Digiwave RG6211000W 1000-feet RG6 Coaxial Cable is professional-quality cable with 18 gauge copper clad steel center conductor. Cable also swept-tested to 3000MHz(3GHz) to assure excellent off-the-reel performance. This cable heavily 60% shielded with 100% foiled to minimize interference. Copper clad steel conductor maxima the cable length you can run. Cable jacket is sequentially marked to keep track of cable used. 100 ft. RG6 Coaxial Cable in Black The RG6 coax cable is used for CATV-community antenna television and VCRs and CCTV-closed-circuit television. It uses F-plugs to connect on both ends. It features low-loss, double shielding which ensures less interference in your picture and sound. 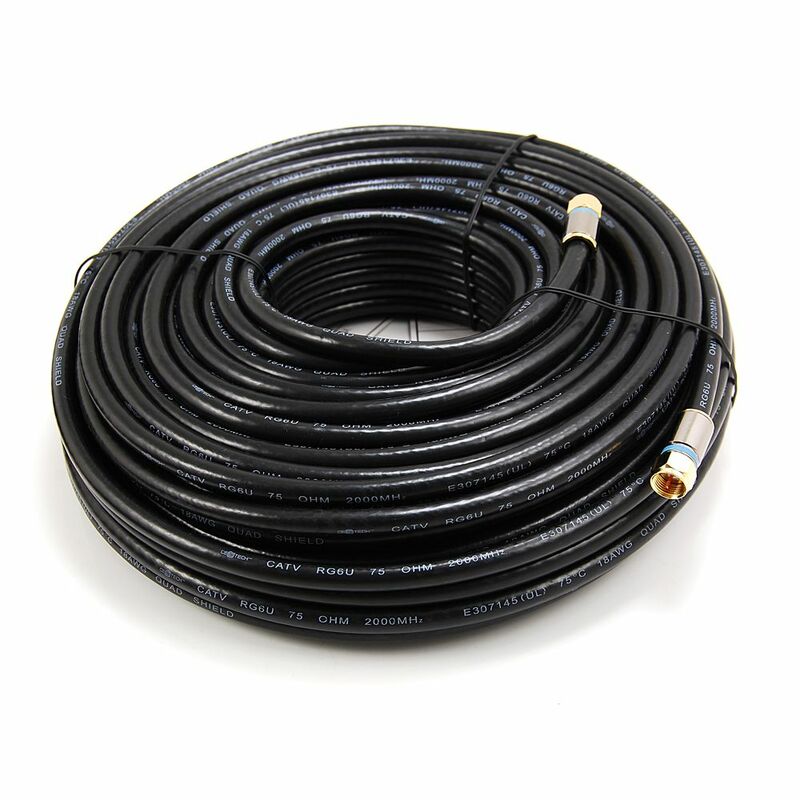 100 ft. RG6 Coaxial Cable in Black is rated 4.8 out of 5 by 12. Rated 5 out of 5 by HomeDepotCustomer from Works great!... Works great! Rated 4 out of 5 by Bob2 from Glad they had it in 100 feet. ... Glad they had it in 100 feet. Rated 5 out of 5 by Kak2354 from Great cord! I needed something to carry a heavy load... Great cord! I needed something to carry a heavy load and this cord is doing the job great. Rated 5 out of 5 by LL from A bit of a hassle to unroll if not familiar... A bit of a hassle to unroll if not familiar with wire spooling. Otherwise it’s fine. Rated 5 out of 5 by Bambino from Worked great and my wife even assisted me in the installation. Everything came out fine. Cable we... Worked great and my wife even assisted me in the installation. Everything came out fine. Cable well made and looked great!